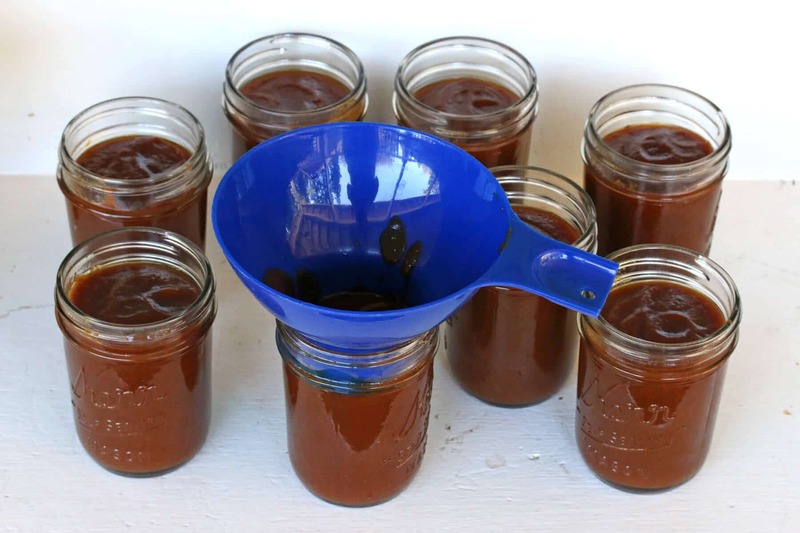 If you’re an apple butter fan you’ve got to try this with pears. A fuss-free recipe utilizing the slow cooker, simply dump in the ingredients and let the slow cooker work its magic. The result is a wonderfully deep, caramelized flavor that comes from slow cooking the pears with brown sugar for hours and hours. Use this Caramel Pear Butter on your favorite scones, muffins or toast; stir some into your favorite barbecue sauce; use it as a glaze for ham, pork and chicken; add some to your apple pie; use it in place of oil in your cakes, muffins and cookies for added sweetness, flavor and moistness; spread some on your ham & cheese sandwiches for a tasty twist! Wash and quarter the pears. Discard the cores and stems. There’s no need to peel them. Place them in a slow cooker. 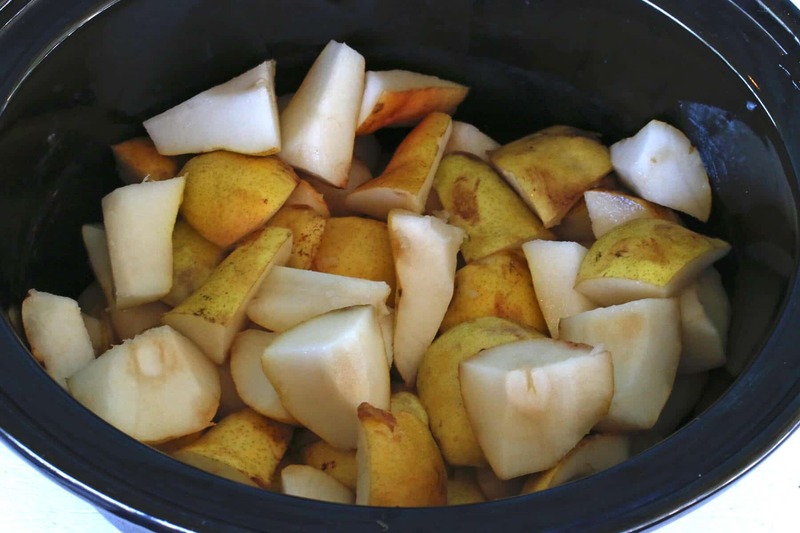 I’ve been using my Hamilton Beach Stay or Go Slow Cooker for several years and love it. Since buying mine they’ve come out with a programmable version which, for just an extra $10, is a super convenient feature to have. Add the brown sugar and the spices. Close the lid and cook on LOW for 8-10 hours or on HIGH for 5-6 hours. Use an immersion blender (or transfer to a countertop blender) and puree until smooth. I’ve had my Cuisinart Immersion Blender for 7 years and it’s still going strong – I love it! The pear butter will be very watery. 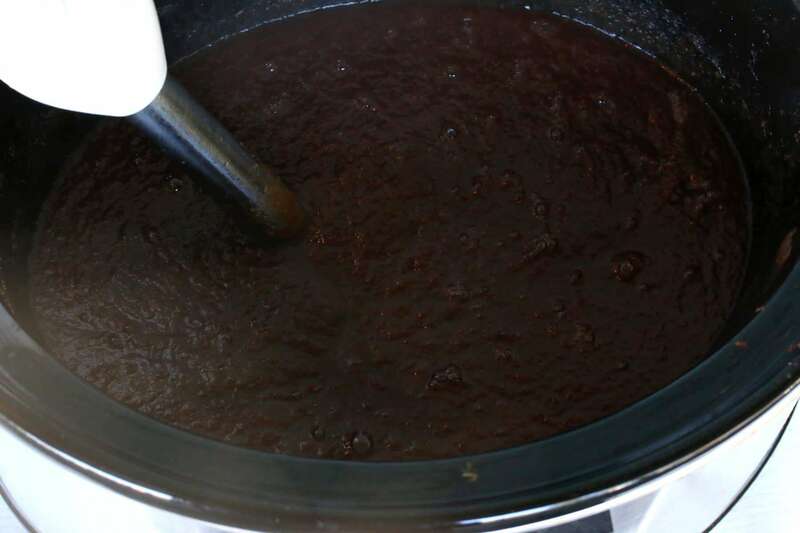 Leave the lid open and continue to simmer on LOW for 6+ hours (or on HIGH for 4+ hours) until the pear butter has thickened to the desired consistency. Taste the pear butter and if you’d like it sweeter you can add more brown sugar and let it simmer for another 30 minutes or so. Optional: Pears have a bit of grittiness to them and if you want a smoother pear butter you can run it through a food mill before canning it. They’re not cheap but you can often find them in your local thrift shops. I picked up two of them at Goodwill for about $6 each. At this point you can either simply ladle the pear butter into jars and keep it in the fridge for up to two weeks or give it away as gifts, OR can it for long-term storage. To can you Caramel Pear Butter ladle the hot pear butter into sterilized jars, leaving 1/4 inch headspace from the top. Screw on the washed lids and rims. Now it’s time to process them in a water bath. Process in a boiling water bath for 10 minutes. 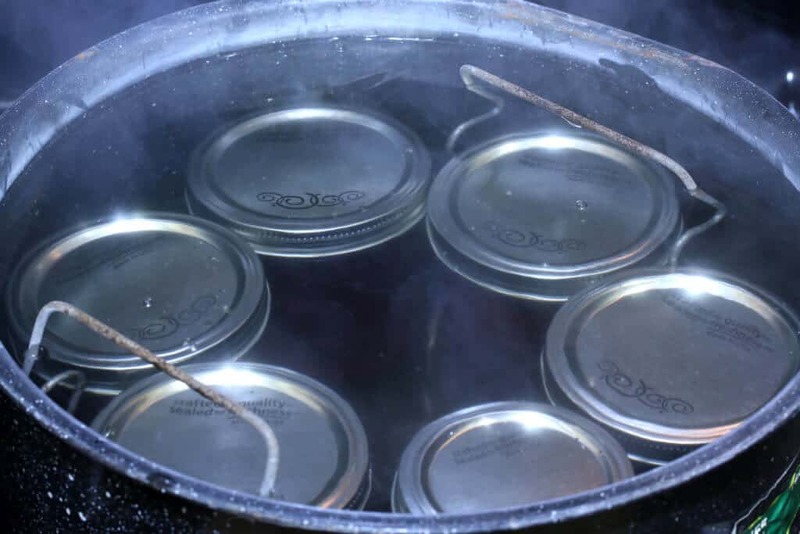 Be sure the jars are covered by 1-2 inches of water. 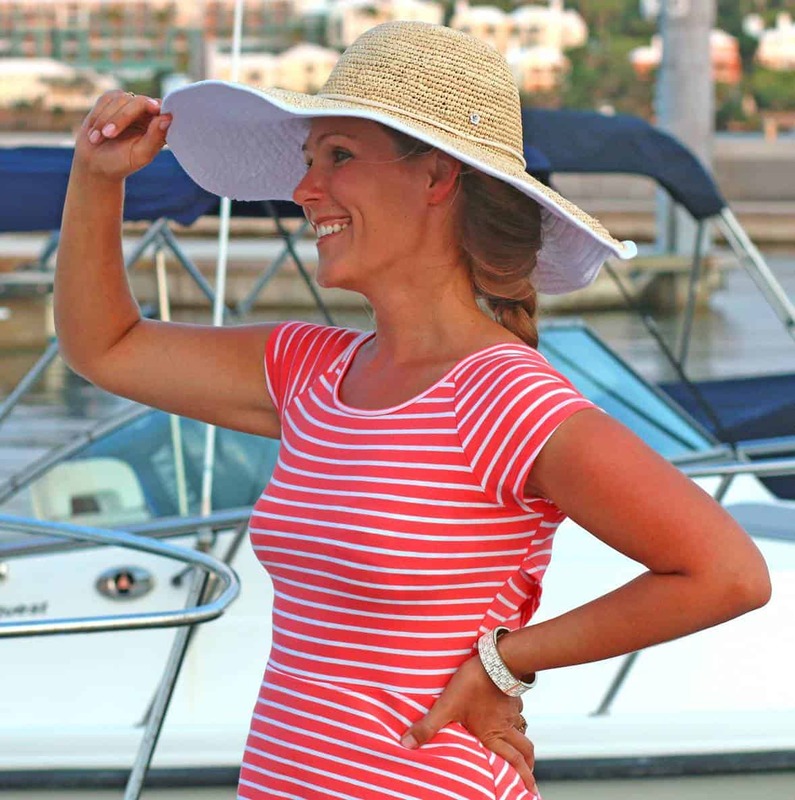 Remove and let sit undisturbed for 24 hours before moving them. Store in a dark, cool place for up to a year. For best flavor consume within 4-6 months. 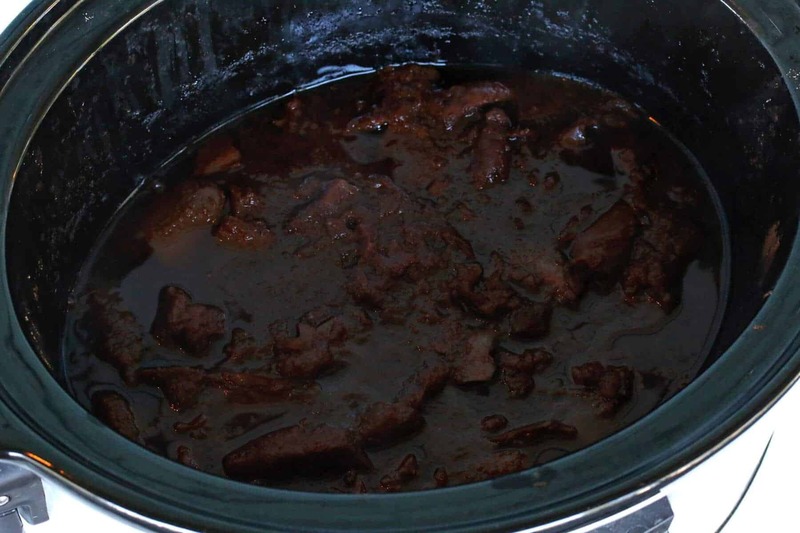 Place all the ingredients in a slow cooker and cook on LOW for 8-10 hours or on HIGH for 5-6 hours. Use an immersion blender (or transfer to a countertop blender) and puree until smooth. 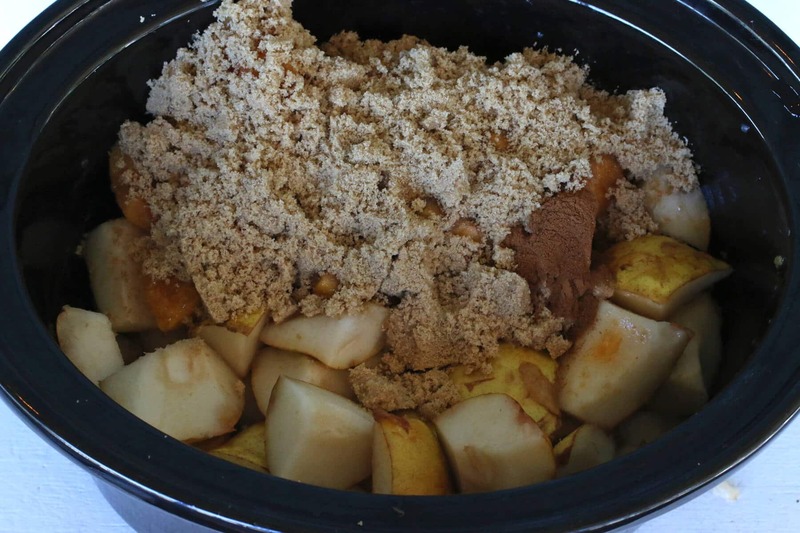 Leave the lid of the slow cooker open and continue to simmer on LOW for 6+ hour, or on HIGH for 4+ hours, or until the pear butter has thickened to the desired consistency. Taste the pear butter and if you prefer it sweeter add some more brown sugar and let it simmer for another 30 minutes or so. Optional: Pears tend to be a little gritty. 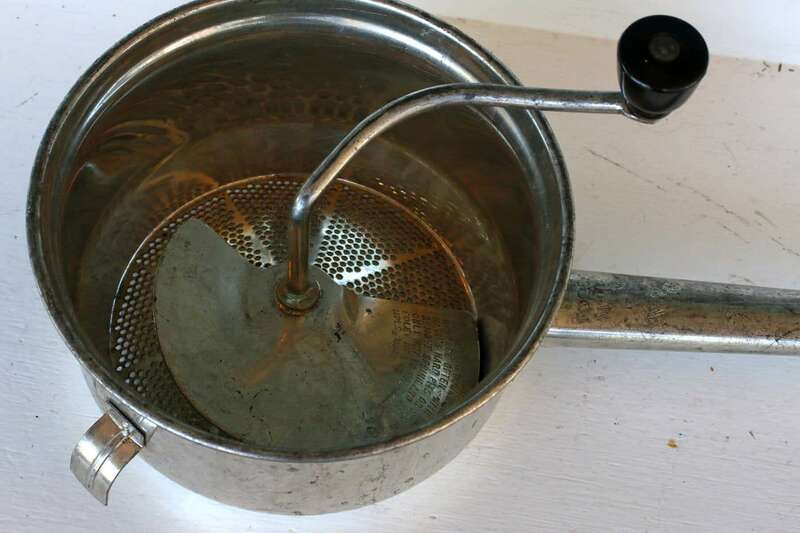 For a smoother taste, process the pear butter in a food mill. If you're not canning the pear butter, it will store in the fridge for about 2 weeks. 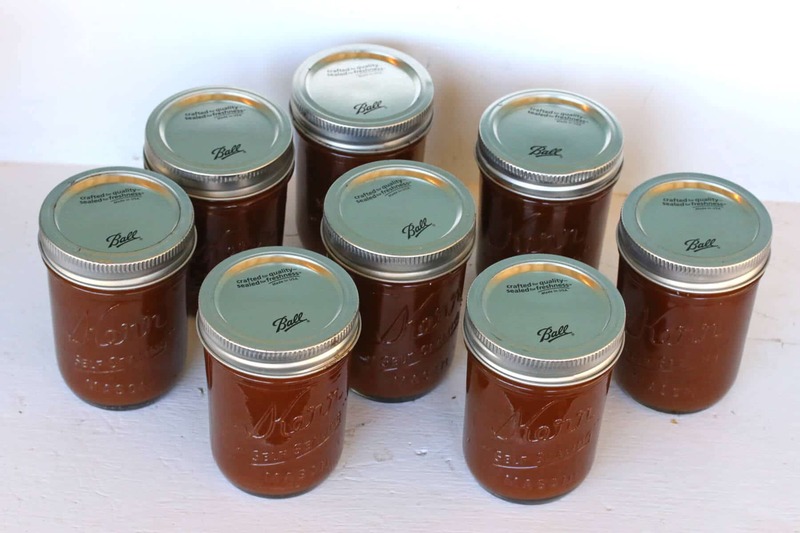 To can for long-term storage: Ladle the hot pear butter into sterilized jars and screw on the washed lids and rims. Process in a boiling water bath for 10 minutes. Remove and let sit undisturbed for 24 hours before moving the jars. Store in a dark, cool place for up to a year. For best flavor consume within 4-6 months. Oh, my goodness…this caramel pear butter looks so good! I would love some on a slice of toast and a hot cup of coffee right now! 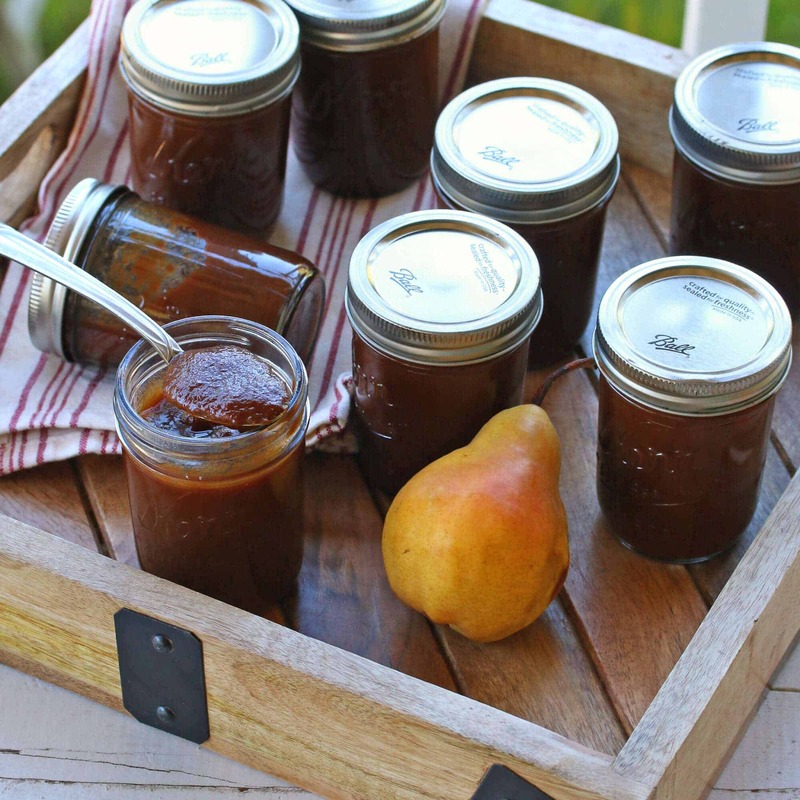 My family loves apple butter, but this apple pear version looks even better! Gotta try it! I bet your house smells amazing!! I love this! I bet this was amazing! I love pears and the idea of pear butter sounds so good for fall baking and slathering on to some toast! sitting here thinking of all the delicious things I can do with this. Oh my WORD, this sounds delicious! I’ve never made pear butter before, and the caramel twist has me drooling. So good! WHOA! I make apple butter every year, but this recipe has me wanting to switch over to caramel pear butter! This sounds delicious! I would love to put this on top of some sort of breakfast goodie. This looks perfect. I love pear butter. I could slather this on everything. My husband loves pear! This is a perfect spread for his morning toast! I have used apples so far but this is a great idea ! Have to try ! Thank you for this creation ! I can’t wait to try this! I would literally put it on everything. And I can only imagine how wonderful your house smells while this is cooking! Yummy! Oh my gosh! How have I never thought of this before! Divine! I have a question about the cooking time before starting this recipe. Do I leave the lid on during the first step? Also, is this a combined cooking time of 16 plus hours on low? Or 10+ hours on high? Hi Roberta, yes, leave the lid on for the first step. 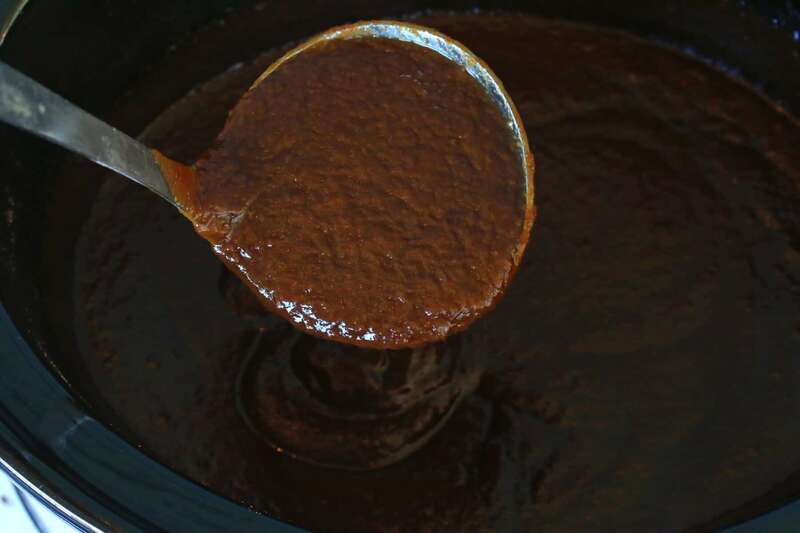 Then leave it off for the second step to allow the moisture to evaporate. That’s an estimated cooking time, it will vary depending on the types of pears you use and their moisture content. But yes, that 16+ hour estimate is for the LOW setting. Thanks! I will try this recipe soon! 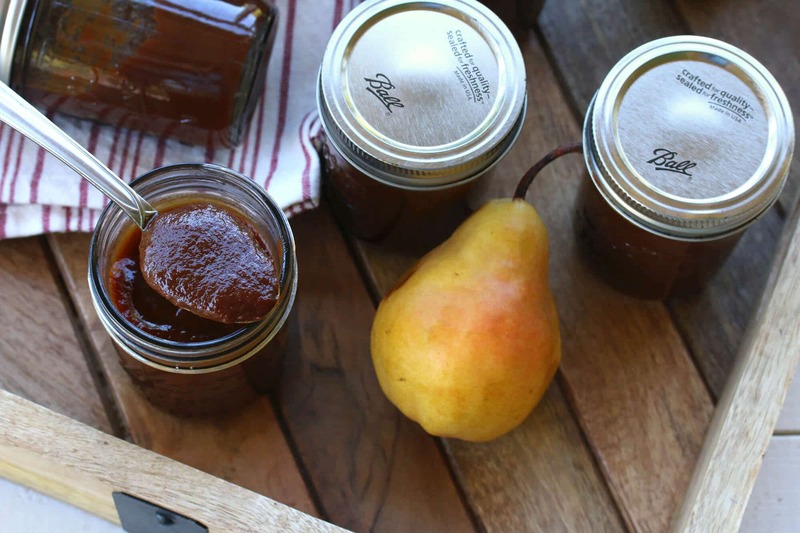 I have a HUGE love for apple butter and my husband loves pears – I think he will go crazy for this version! 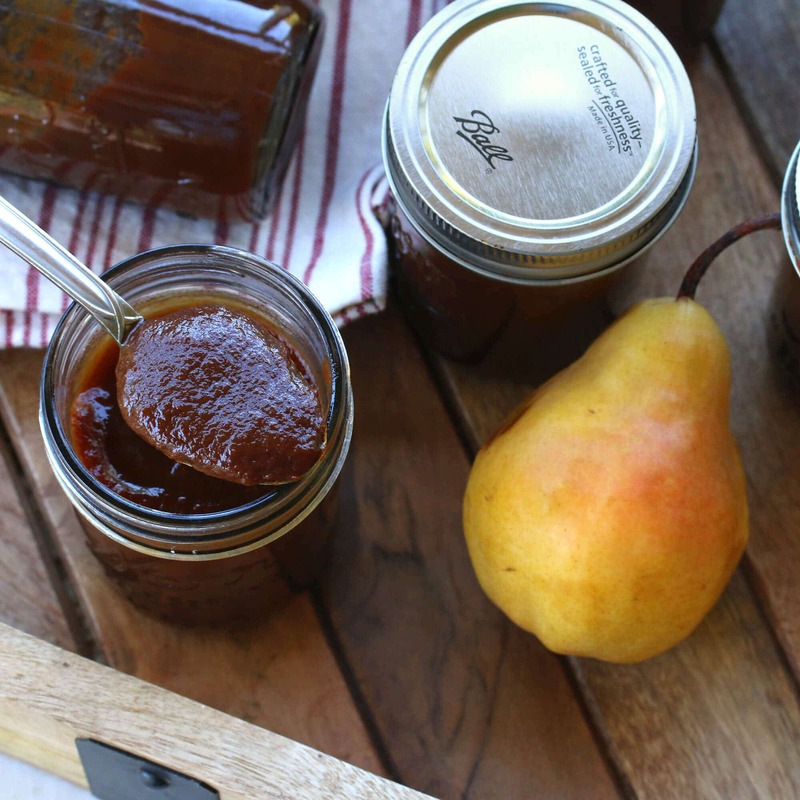 I love apple butter so I can’t wait to try this pear butter! oooo I bet it’s so good! What a great idea! I have lots of pears at the moment, but didn’t think about making pear butter with them. And making them with brown butter makes things even more interesting! Rather than can, can a person put this in the freezer – sort of like freezer jam? Hi Nancy, I’ve heard that apple and pear butter loses some of its thick, rich texture when frozen but yes, it can be frozen. Either in freezer-proof containers or in freezer ziplock bags with as much of the air pressed out as possible. I am almost to the canning step. Tastes great, but I put in extra spices. It is only about half the volume I started with. Try using some organic coconut sugar instead of brown sugar. Really adds a nice depth of flavor. I used lemon juice instead and added nutmeg, ginger, and allspice. Also splashed in a bit of balsamic and a bit of sherry. Had to do this stove-top since my cooker was occupied doing something else. Lol. That was ok because I was home all day so no issues with babysitting a pot of stewing pear chunks. I am confused on the nutrition facts and hope you can clear it up. There is no indication of a serving size that I could find and not being a nutritionist I am in need the disclosure to calculate the nutritional information. For example, the grams of sugar per serving is 161 which is almost a full cup of pure sugar. A days worth of sugar is maximum 50 grams and I try to stay below the American Heart Association recommendation which is 25 grams. If you can help me figure this out, I would appreciate it. Hi Donna, those figures were for the entire batch (3 pints). I’ve adjusted it to now reflect the nutrition info per serving (1 tablespoon).